Over the past few months we have been working on smaller home decor projects until we’re ready to tackle the bigger renovations. These small changes, such as stenciling a simple design over our door, redoing our chairs, and putting together a guest room have made a big difference in their respective spaces. 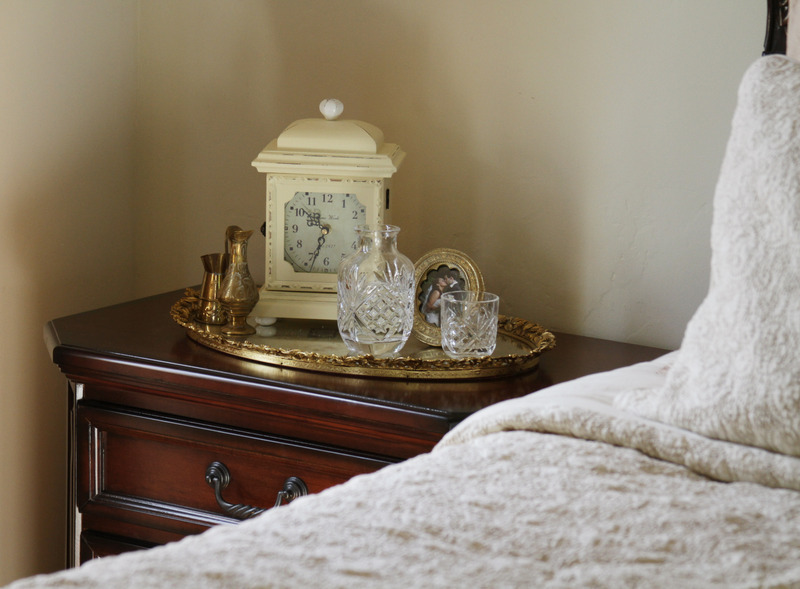 We recently completed another small upgrade, this time in our master bedroom, with the addition of new end tables styled differently for each of us. 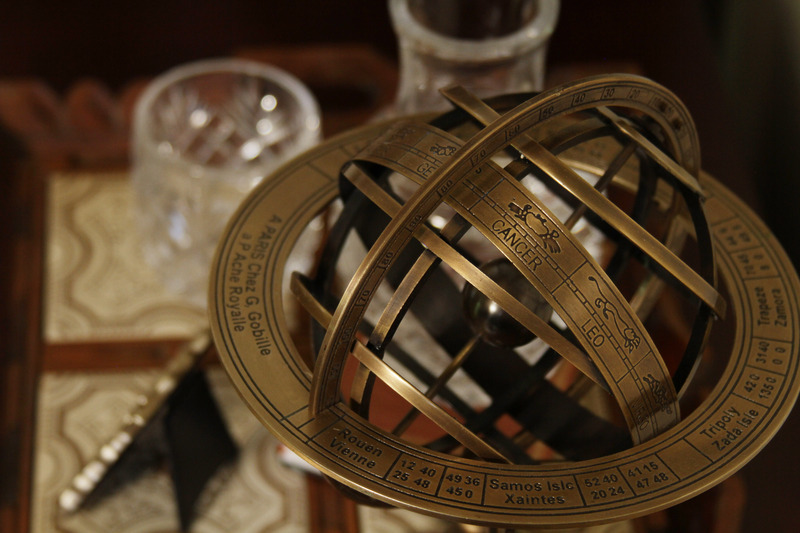 For James’ table we chose a wooden tray and an armillary sphere as the primary pieces. The sphere gives the setup a bit of height, and the tray grounds the items so they don’t look haphazardly laid on the table. 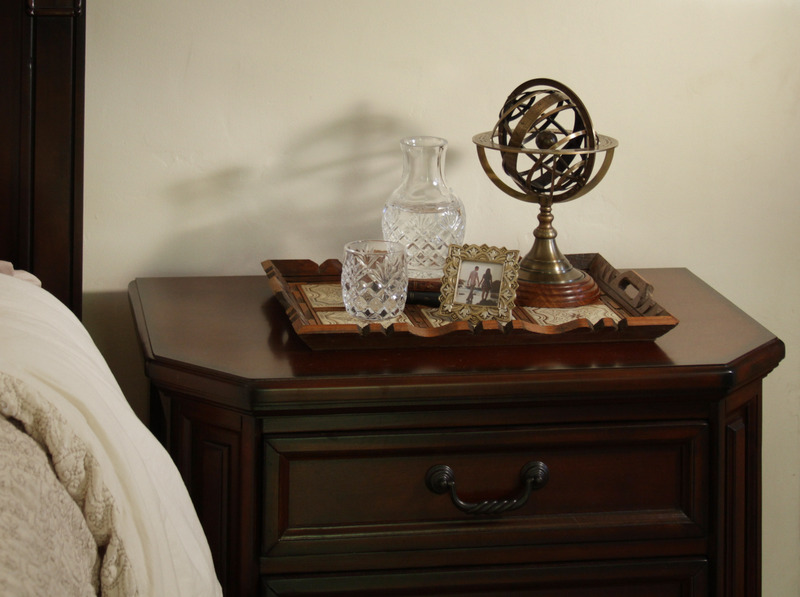 We looked for pieces in shades of brown, bronze, and ivory that coordinate well with the entire room design. 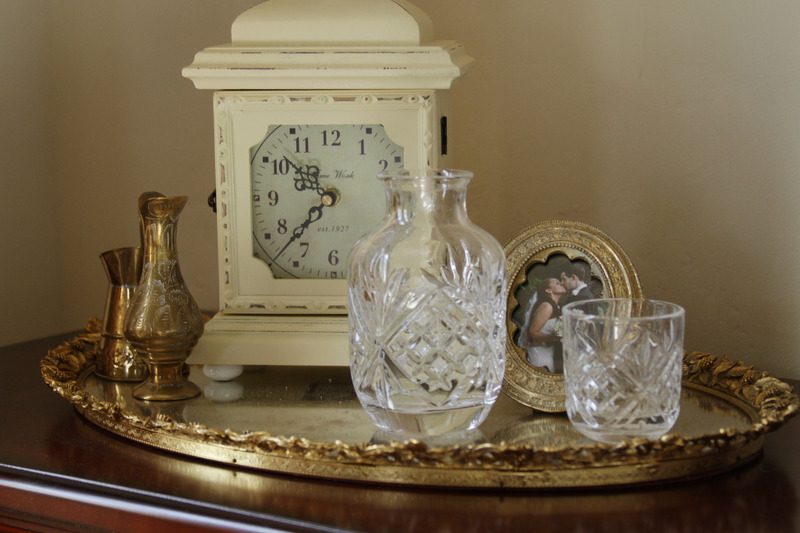 For my table we selected an ivory and gold color palette. 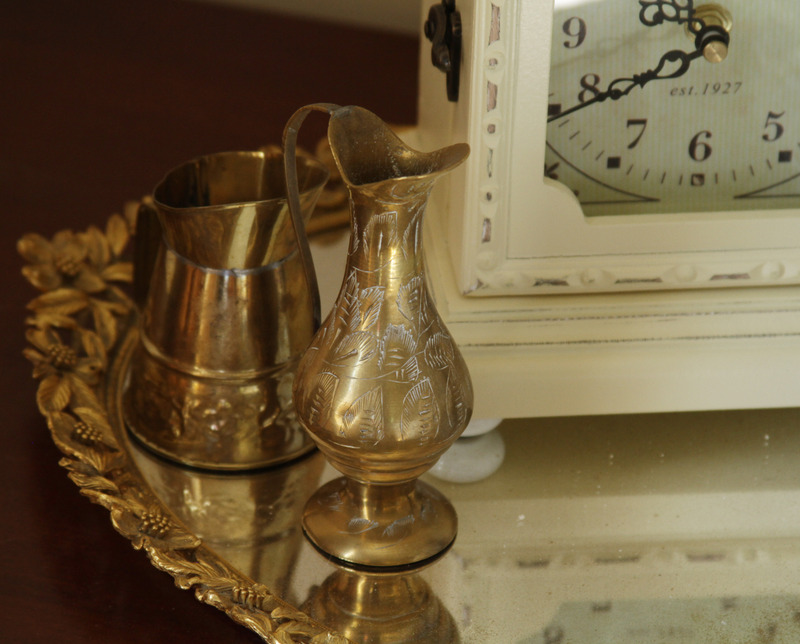 The tray is a vintage mirror that we found at a flea market, and the gold containers belonged to James’ grandmother. 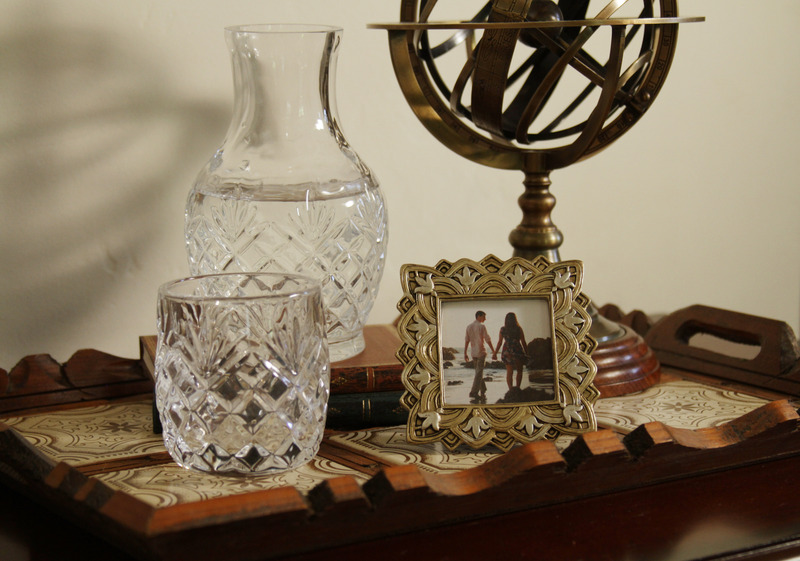 We added decorative frames to both tables, each holding a photograph of us together, and a different crystal water carafe on each side. These changes, although small, help to give the room a feeling of warmth and coziness. We’re very eager to eventually see the entire room come together, and fully enjoy the space. Potato salad has always been a favorite side dish of ours. Whenever it’s available on a restaurant menu, we tend to opt for that instead of french fries. 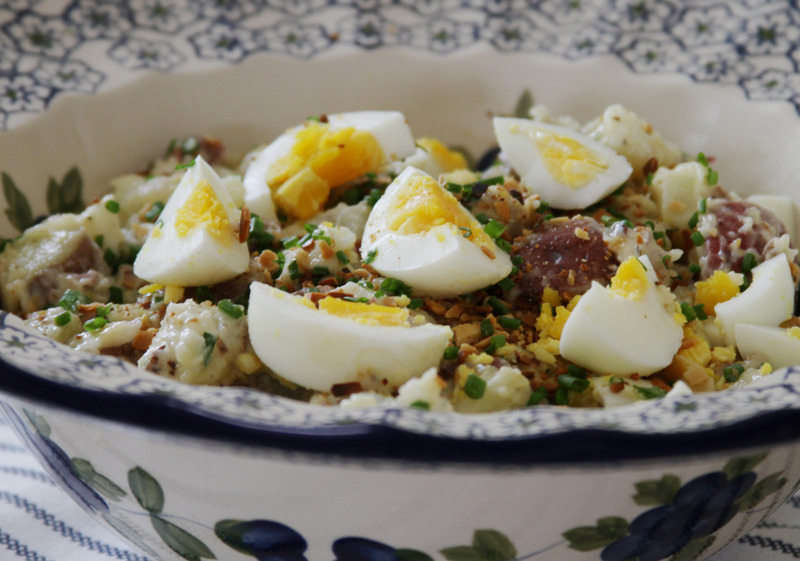 This recipe includes all of the traditional ingredients in potato salad, as well as some additions that give the salad a boost of flavor, such as toasted almonds and spicy mustard. One of the key components is the homemade mayonnaise. Freshly made homemade mayonnaise is light and fluffy, and adds just the right amount of flavor to the potato salad, while also avoiding the sometimes unpleasant texture of store-bought mayonnaise. Mayonnaise ingredients: 1 egg, 1 1/4 cup extra light tasting olive oil, 1/2 tsp mustard powder, 1/2 tsp salt, 3 tbsp lemon juice. Note: all ingredients should be at room temperature. Mayonnaise instructions: add the egg, 1/4 cup of oil, mustard powder, and salt to a glass stand mixer bowl. Start mixer at a medium speed and run for a few seconds, until ingredients are combined. Raise the speed of the mixer to high, and slowly drizzle in the remaining cup of oil. It’s important for the oil to be added very slowly for it to emulsify and create the right consistency. Once the oil is completely added turn off mixer and add lemon juice, mixing in with a spoon. 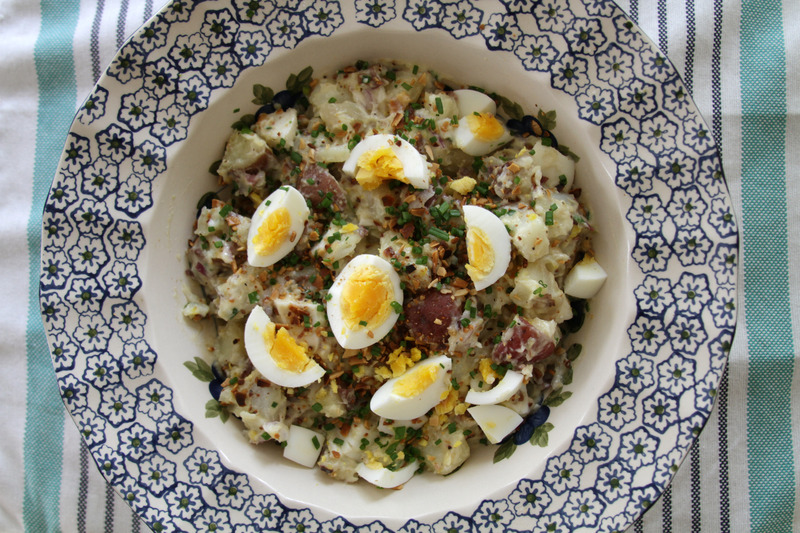 Potato salad ingredients: 10 medium red potatoes, 1/4 cup slivered almonds, 4 eggs, 2 tbsp chopped chives, 2 tbsp spicy brown mustard, 1/4 cup thinly sliced red onion, 3/4 cup homemade mayonnaise, salt and pepper to taste. Potato salad instructions: bring a large pot of salted water to a boil and add potatoes and eggs. Cook the eggs for 10 minutes, remove from pot, and place in cold water. Once eggs are cooled peel and chop. Cook potatoes for about 15 minutes, until easily pierced with a fork, but still firm. Drain potatoes and set aside to cool. Add almonds to a frying pan, and toast on stovetop for about three minutes, until almonds have started to brown. 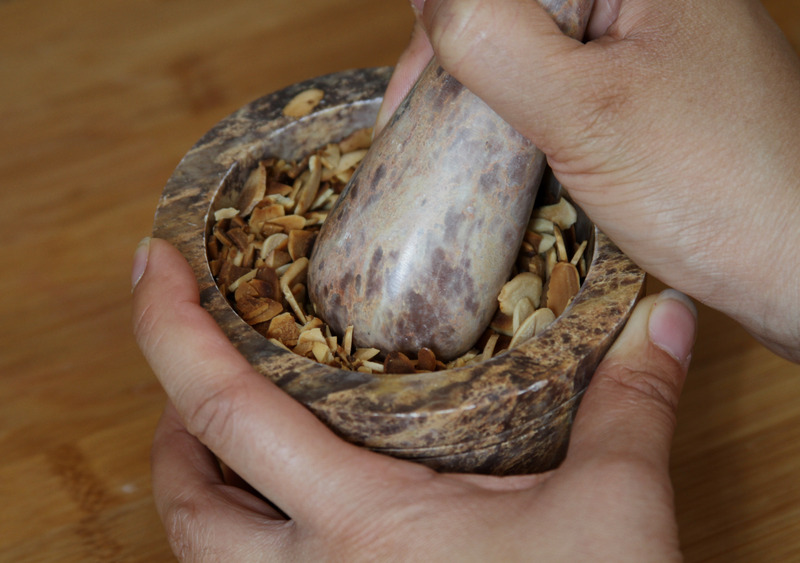 Grind almonds into small pieces and add to a large bowl. Chop potatoes into small chunks and add to bowl along with mustard, onions, chives, eggs, and mayonnaise. Thoroughly mix all ingredients, adding salt and pepper to taste. This salad is a great side dish for any entrée, or as a stand-alone snack. The almonds give it a great crunch, and the homemade mayonnaise is well worth the effort.